Wonderfully delicious, almonds have long been revered as an epitome of wellness and health. The kernels are among the richest sources of health-benefiting nutrients essential for optimum health. Despite being high in fat, they are highly nutritious and extremely healthy. Almonds are the healthiest nuts you can get, though it isn’t exactly a nut, but more of a seed. They belong to the group of prunus, a variety of trees and shrubs which also comprise the families of apricots, cherries, plums, and peaches. Almonds were initially found in North Africa, West Asia and in the Mediterranean regions. They are rich in vitamins and minerals, and are high in dietetic fiber and monounsaturated fat, which makes the heart healthy. The benefits of almonds are almost endless! Cholesterol reduction is the most celebrated health benefit of almonds, but there are many other vital health benefits of almonds nutrition. Almonds are low in saturated fatty acids, rich in unsaturated fatty acids, and contain filling fiber, unique and protective phytosterol antioxidants as well as plant protein. Almonds were first spread by humans in ancient times along the shores of the Mediterranean into northern Africa, Asia and southern Europe, eventually making their way to the U.S. Along the way, the word “almond” was given to the nut, which comes from the old French word almande. Historically, almonds have meant many things to various cultures. Hebrew literature from 2,000 B.C. mentions almonds, as does early literature from Turkey, Romania and the Baltic peninsula. The Bible also makes numerous references to almonds, describing them as an object of value and a symbol of hope, for example, in Genesis 43:11. King Tut also took several handfuls of almonds to his grave dating back to 1352 B.C., and years later almond trees were believed to grow near trade routes like the famous Silk Road that connected central China with the Mediterranean. Lowers Cholesterol — Almonds are a good resource of monounsaturated fats and polyunsaturated fats, which facilitate in lowering the LDL (bad) cholesterol. Eating almonds as part of our regular diet can help raise HDL cholesterol, or “good” cholesterol, levels. Prevents Cancer — The fiber present in almonds helps in detoxifying the body. It enables food to move through the digestive system more efficiently. This process cleanses the digestive system. Almonds are also an excellent reserve of vitamin E, Phytochemicals, and flavonoids, which controls the progression of breast cancer cells. Protects Against Diabetes — Almonds have a stumpy glycemic index (GI). Studies demonstrate that almonds have the ability to decrease the after-meal escalation in blood sugar. Therefore, they assist in stabilizing blood sugar levels and offer protection from diabetes. 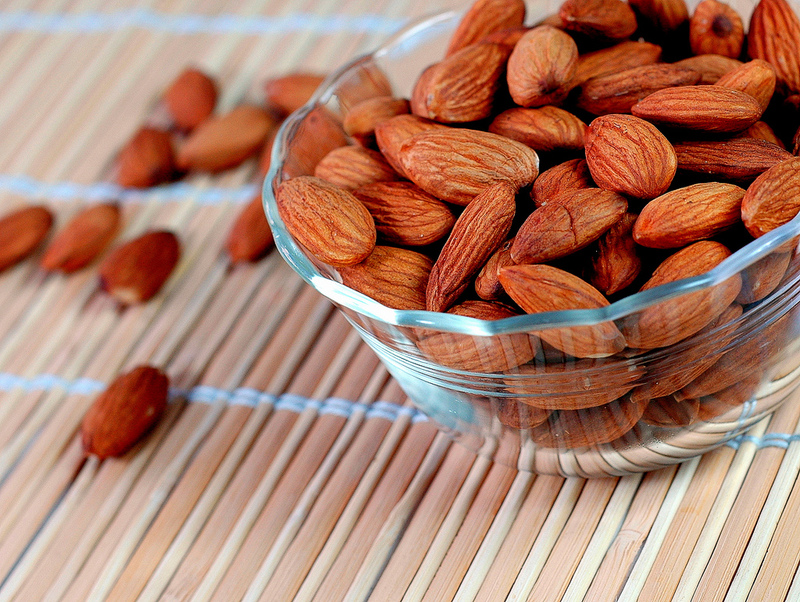 Boosts Energy — Almonds are rich in manganese, riboflavin, and copper, all of which aid in manufacturing energy. If you are always on the go, try making your own almond energy bar, and take your power source with you. Improves Brain Power — Scientific readings for almond benefits showed that they contain riboflavin and L-carnitine, nutrients that help in the growth of the brain cells. Almonds also contain phenylalanine, a brain-boosting chemical that aids our cognitive functions. Ayurveda advises having five almonds soaked in water first thing in the morning every day for maximum brain strength. Strengthens Bones and teeth — Almonds are a good source of micronutrients such as calcium and phosphorus, which avert osteoporosis and strengthen our bones and teeth. Almonds also provide other nutrients that improve bone mineral density and strengthen the skeletal system. Remedy for Anemia — Anemia is caused when red blood cells carry less quantities of oxygen. Almonds contain copper, iron and vitamins, which work as a catalyst in the synthesizing of hemoglobin. Therefore, almonds can be used as a preventive measure for anemia. Strengthens and Nourishes Hair — Almonds contain hair-friendly nutrients like polyunsaturated and mono fatty acids as well as vitamin A, D, B1, B2, and B6. These nutrients penetrate into the hair strands and make the hair healthy and beautiful. The combination of fatty acids and fats in almond softens, strengthens and nourishes the hair. Promotes Hair Growth — Almonds contain high amount of magnesium, which is an essential mineral for having healthy strands. Deficiency in magnesium is often linked to hair loss; therefore, consuming magnesium through almonds not only helps to maintain proper functioning of the body but also enables hair growth. Maintains Skin Health — Almonds are a great source of vitamin E and other antioxidants that nourish the skin and reduce signs of aging. Increases Nutrient Absorption — The body needs adequate amounts of fat in the diet in order to properly absorb “fat-soluble” nutrients, like Vitamin A and D. Almonds are also considered one of the only nuts that help alkalize the digestive tract, reducing acid buildup and balancing the body’s pH. Helps Maintain dental and Bone health — Almonds are a good source of trace minerals, including magnesium and phosphorus, which is a crucial nutrient for building and maintaining strong teeth and bones. Almonds nutrition benefits include the ability to help prevent tooth decay, fight cavities, lower the risk for bone fractures and fight osteoporosis. So, don’t wait. Start including almonds into your daily routine to experience the difference! Enjoy the benefits of the amazing almond to the fullest!